The Canadian Housewife: Exercise Update! I promised to keep you all updated on how my exercising was going. So here you go. I haven't been doing as well as I had hoped with keeping up with my Wii dance workouts. Shocking, I know. I got in a rut and didn't do them for 3 weeks and since then I just can't seem to pick them back up. But I did get one in last week, as well as some time on the WiiFit. So that's something. 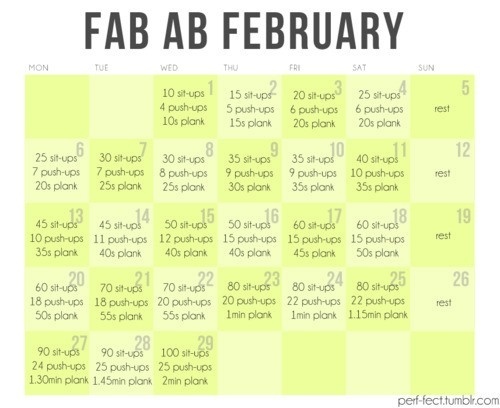 I started something else new last week, called Fab Ab February. Yes, I realize that it is now March but who cares. Better late than never right? And in case you can't read that tiny writing, here is the link to it on Pinterest. It's really hard. At least it's really hard for me to do in my weakened lazy state. But I'm pushing through and have just completed day 6. I got stuck on day 4 for a couple days but I made it through! I'm actually really proud of myself for continuing on with it even though my abs hurt like crazy. So the plan is to keep at it, even if it takes me longer than a month. I've also had a pretty active weekend. 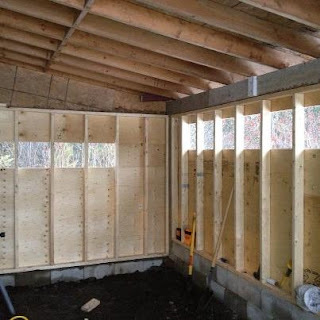 Dan and I have been building walls. Here's a sneak peak. Don't worry, I'll be posting more on that later. Back to exercising. So yes, Active Weekend + Fab Ab February = Sore Tired Jenn. But I've got plans and goals here! Starting April 1st, I'm going to start up the Couch to 5k running program again. Yes, again. I started it back in April 2011 and lasted a week. But this time I'm going to finish it! Then, when I've completed the 9 weeks, I will run a 5k race. I've already picked out the one I'll be participating in, it's on June 1st. I'm going to hopefully sign up for it this weekend. So there you have it, my update on getting moving. Not fabulous but not horrible. Oh, and as a random side note, I weighed 112.8lbs this week at my weigh in! I'm going up! Congrats on the additional weight gain! and I want to try the Couch to 5K at some point - can't wait to hear how it goes! You come visit me, I can fatten you up no problem!! And then we will go for a run because Im training for a 10K!! Kate - Thanks for the congrats and I'll be sure to keep you all posted on how the running goes. Casey - Thanks for the offer to fatten me up. :P And I'm still so impressed you're going to do a 10K! Congrats Jenn! Your progress is so inspiring! When one thing is boring or just doesn't work any more it's always smart to move on to something else. So don't feel bad about the dance workouts...I'm sure your ab workouts are just as tough! And as a side note I love the weight update :) I wish I could be there to celebrate with you and have some gluten free cake or something! Erin - Thank you for your support and encouragement. :)I really appreciate it in every area of me life. And GF cake sounds like a fabulous idea! Off to Pinterest to find a good recipe. I wanna do the Couch to 5K with you! I did it last year and loved it, but didn't do a race obviously, lol. Vicky! You should totally start it with me again. Maybe this time, I'll actually complete it. :P And if you want, you can even run the 5k with me in June. I always love as much support as I can get. Good for you for getting back to it. It's so easy to say "Well, I haven't been doing it so I might as well not worry about it at this point." I did the Couch 2 5K program back before getting pregnant with William and loved it. You really don't realize the progress you're making because it's so incremental. Good luck and congrats on the weight gain! Stasy - Thanks for the encouragement, I'm excited to start the Couch to 5k program. It's good to know you enjoyed it!